I lay these things, stone by stone on this rocky mountain top. And I pile them together, brick by brick and I form my altar. 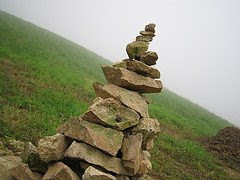 With each utterance, my heart has become like stone. These burdens that I carry. The weight bears down on me. And I crawl through this desert land on my hands and knees. Rocks cut my skin and my tongue is parched. I have painstakingly built this altar. Brick by brick. Stone by stone. Each one picked out by my pride. And it towers over me and scrapes the clouds above me. But even with the clouds, the sun beats down on me and I cannot hide. Bones ache. I never meant to be the one who judged, but now each judgment reflects back at me and I am left without words. The things I despised, I long for. The things I ridiculed, I embrace. The things I didn't understand I now seek as peace. You have taken every situation and turned it around and I am left breathless. I see two paths ahead of me and I am completely at a loss of which to venture down. Would you speak to me, loudly and clearly? Would you take my hand, raise me from the dirt, and place my feet where you desire? Melt my hardened heart. Breathe life back into me. Take my glassy eyes and set them to You. My blistered hands let go of all I hold dear. And so here, I raise my Ebeneezer. For You. 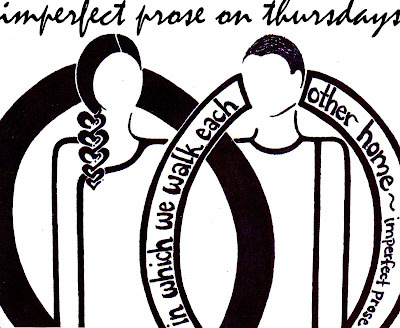 Today I am linking up with the talented and giving Emily Wierenga for Imperfect Prose. 061 - A reason to get up every morning. 062 - Pumpkin spice cookies. 063 - A good report from yet another teacher. 064 - Discovering your middle LOVES yogurt covered pretzels. 065 - An evening spent crafting with some wonderful women. 066 - Waking up to a clean house (because you had some wonderful women over the night before). 067 - An impromptu trip to the Farm Museum to cheer some weary preschool souls. 068 - Using gift certificates to order new flatware that you've been wanting since you got married. 069 - Realizing your baby is now 18 months and smart as a whip! 070 - Getting a post done, and finished, even if it was a painful one to write. Ebenezer is my baby's middle name. As He has helped us in the past, so He will help us in what is to come. Behind and before. Hemmed in. Love how you've entwined your heart with this psalm. So living, it breathes on its own. You have opened up your deepest places here and I pray for the vulnerability that will rush in as a result. We are all prone to wander friend and so you are not alone. May your offering here bind your heart to His. oh girl. thank you for sharing your soul with us, for allowing us to lay our hearts bare beside yours. this is a holy place, yours. so much love to you sweet friend. e.